Nairobi, 16 April 2015 – The East Africa retail sector continues to see growth with international retailers such as Carrefour, The Foschini Group and LC Waikiki among others setting up shop in the region. Among the retail projects in East Africa that Broll is involved in, are Two Rivers, Garden City Mall and The Hub, all in Nairobi, as well as Penninsula Mall in Dar es Salaam in Tanzania and Market Shopping Centre in Kigali Rwanda. Situated along the Thika Superhighway is the mixed-use development, Garden City Mall (Broll leasing and management), with a total GLA of 56,000m2, the mall is set to open on 28 May 2015. Anchors include Game, Nakumatt, Tile & Carpet and Victoria Courts. 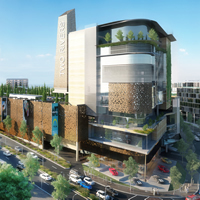 The Hub – (Broll leasing and management) also a mixed-use development measuring 31,000m2 will open in September 2015 with anchors such as Carrefour and Virgin Active. Broll is also involved in the leasing and will manage Buffalo Mall which opened in February 2015 with Tuskys as an anchor. The mall has a GLA of 8,000m2. Located in Nairobi Kenya, Two Rivers is a mixed-use development with a total GLA of 94,500m2 of which 65,000m2 is retail, 25,000m2 offices and a Virgin Active Gym taking up 4,500m2. Broll Kenya has been mandated to lease the retail and office component of the development as well as manage the mall and the estate, says Musyoki. The retail component, set to open for traded in October 2015, includes anchors such as Carrefour, LC Waikiki, Woolworths, Mr Price, Truworths, the Foschini Group and KFC. Two Rivers located along Limuru Road and bordering the Northern Bypass is 14km from the CBD and is within close proximity to the UN headquarters and a number of embassies such as the American, Canadian and Belgium Embassies. The retail catchment area includes the neighboring affluent areas of Gigiri, Runda, Nyari, Red Hill, Spring Valley, Westlands, Muthaiga Lavington and Loresho as well as a rapidly growing middle class on the opposite side on the North. A host of international schools are also within close proximity. Musyoki points out that there is a growing trend in mixed-use developments in Kenya and their popularity stems from the fact that these developments offer retail, residential, offices and entertainment all in one parcel of land. Mixed-use developments offer a sense of security, convenience and cater for the needs of the modern buyer or user. From a retail perspective, the mix of residential and offices feed into retail hence creating a guaranteed footfall and customer base, she adds. Broll has been a sponsor of the East Africa Property Investment (EAPI) Summit since its inception in 2014 and believes in the value that an event of this nature provides not only to investors but also to real estate professionals. The event is a forum which provides delegates with an opportunity to discuss real estate investment opportunities in the East African region.